The grounds of the parish of Henham are in general high, well wooded and richly luxuriant, extending from Widdington southward, and to the hundred of Dunmow space on the east; on the river Granta, or Cam, between this parish and that of ugly, flowing towards Audley End and to Cambridge; and other streams take their course in nearly an opposite direction two towards the Stort and Chelmer which shows the propriety of the appellation ” ad montem”, “at the hill”, usually applied to this parish, its Saxon name Hean, high, and ham, a mansion, being nearly of the same import. In length it is about three, and in breadth, 2 miles: the village contains some good houses, and a place of worship belonging to the Independents. It is on high ground, pleasant, and healthy; distant from Bishops Stortford. In the reign of Edward and the Confessor, the lands of Henham belonged to Ailid, to two freeman, and to Ausgar, a sochman: at the time of the survey they were in the possession of Ralph Baynard, Eudo Dapifer, and Geoffrey de Magnaville. There are three manors; and the Rectory is also a manor. Henham Hall is near the church; and the manor is what belonged to Ralph Baynard, from whom it passed to his son Geofrey, and to his grandson William, on whose forfeiture, for the desertion of the cause of King Henry the first in his contest with Stephen, this possession was given to Robert, a younger son of Richard Fitzgislebert; whose son Walter was his successor, followed by Robert, son of Walter, who assumed the surname of Fitzwalter, borne by his noble descendants, barons of the realm, for many generations. Elizabeth, daughter and heiress of Walter, Lord FitzWalter *, conveyed this inheritance, by marriage, to Sir John Ratcliffe, who died in 1461. Robert, his descendant, created Earl of Sussex in 1529, to his second lady had Francis, daughter of Hercules Meutas, of West Ham, widow of Francis Shute, Esquire, and she, at the time of her decease, in 1627, held this manor of Henham, and the rectory, of the King by knight’s service. Her daughter and heiress, was Jane, married to Sir Alexander Ratcliffe, who had this possession in 1635, which he sold to Lawrence Wright, M.D. of Dagenhams, in Havering: he died in 1657, and, with Mary his wife, was buried in the church in South Weald. Sir Henry Wright, bart of the same place, was his son and heir: he married Anne, daughter of John, Lord Crew, of Stene, by whom he had Henry, who died in 1681 aged 19, and Anne. He himself having died before his son, in 1663, aged 27; they are both buried in the church in South Weald. The widow, Lady Anne Wright, enjoyed this estate as part of her jointure, till her decease, in 1708, when it descended to her daughter Anne, a very rich heiress; married, first, to Edmund, son of Sir Robert Pye, of Farringdon, in Berkshire; afterwards to William Rider, Esquire. 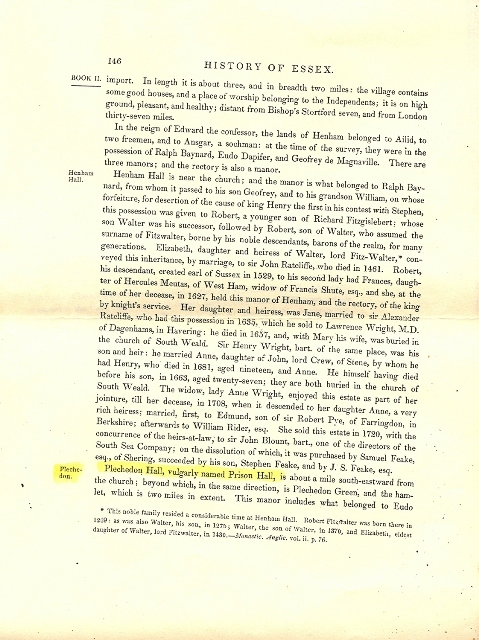 She sold this estate in 1720, with a concurrence of the heirs at law, to Sir John Blount, bart, one of the directors of the South Sea Company; the dissolution of which, it was purchased by Samuel Feake, Esquire of Sheering, succeeded by his son, Stephen Feake, and by J. S. Feake, Esquire. In Plechedon Hall, vulgarly named Prison Hall, is about a mile south eastward from the church; beyond which, in the same direction, is Plechedon Green, and the hamlet, which is 2 miles in extent. This manor includes what belonged to Eudo Dapifer **; next to whom the earliest possessor on record was Gilbert Peche in 1274, and a second Gilbert Peche in 1322, held this manor of Adomar de Valence, Earl of Pembroke, by the service of the fourth part of a knight’s fee; as did also Gilbert, his son and heir. In 1360, it had become the property of John Malewayn; soon after which it gained went to the Peche family, and was conveyed by Katherine, daughter and heiress of Sir Geoffrey Peche, to her husband, Thomas Notbend ***. She died in 1405, holding this estate of Ralph Neville, Earl of Westmoreland, as of his honour of Clavering. Mirabel, wife of Robert Geddying, and Margaret, wife of John Hinckley, were her daughters and co-heiresses. Afterwards the whole estate became vested in Margaret Hinckley, who died possessed of it in 1442, leaving her daughters Alice, wife of John Marshall, and Cicely, wife of Henry Calderbeck, her co-heiresses. 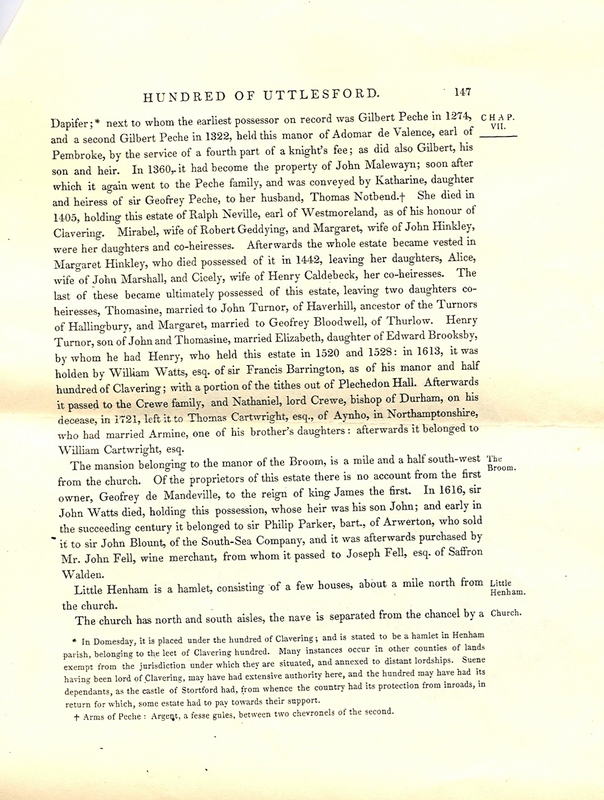 The last of these became ultimately possessed of this estate, leaving two daughters co-heiresses, Thomasine, married to John Turnor, of Haverhill, ancestor of the Turnors of Hallingbury, and Margaret, married to Geofrey Bloodwell, of Thurlow. Henry Turnor, son of John and Thomasine, married Elizabeth, daughter of Edward Brooksby, by whom he had Henry, who held this estate in 1520 and 1528: in 1613 it was holden by William Watts, Esquire of Sir Francis Barrington, as of his manor and half hundred of Clavering; with a portion of the tithes out of Plechedon Hall. 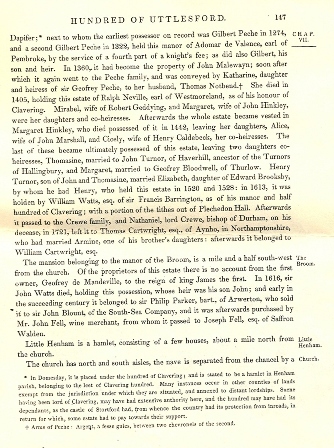 Afterwards, it passed to the Crew family, and Nathaniel, Lord Crew, Bishop of Durham, on his decease, in 1721, left it to Thomas Cartwright, Esquire, of Aynho, in Northamptonshire, who had married Armine, one of his brother’s daughters: afterwards it belonged to William Cartwright, Esquire. The mansion belonging to the manor of the Broom, is a mile and a half south-west from the church. Of the proprietors of this estate there is no account from the first owner, Geoffrey de Mandeville, to the reign of King James the first. In 1616, Sir John Watts died, holding this possession, whose heir was his son John; and early in the succeeding century it belonged to Sir Philip Parker, Bart of Arwerton, who sold it to Sir John Blount, of the South-Sea Company, and it was afterwards purchased by Mr John Fell, wine merchant, from whom it passed to Joseph Fell, Esquire of Saffron Walden. Little Henham is a hamlet, consisting of a few houses, above ma’am more from the church. The church has North and South aisles, the nave is separated from the chancel by a screen, and the Gothic arches of the aisles supported by massive clustered pillars; the building is large for a country village. A massive tower at the west end, above which a lofty spire rises, contains a good ring of 5 bells. 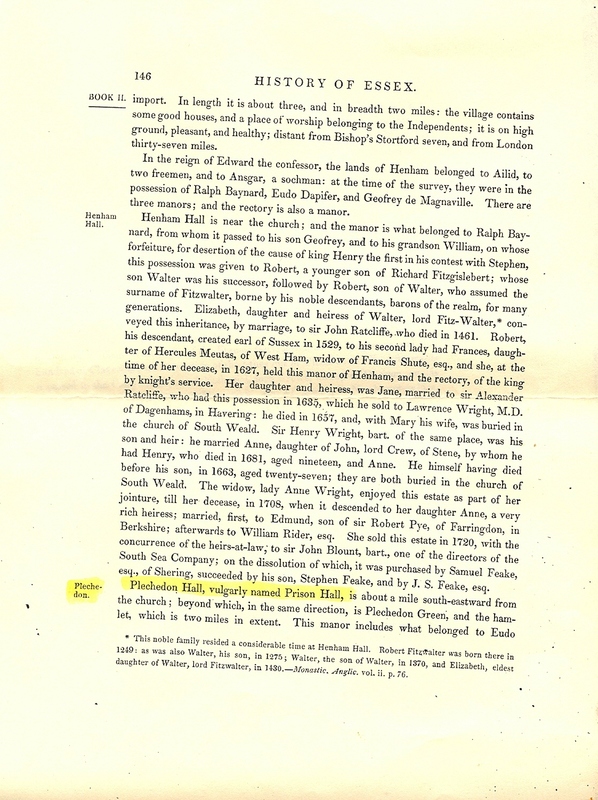 Robert, son of Richard Fitzgislebert, gave two parts of his lordship of Henham to the priory and cannons of Little Dunmow; and his son Walter gave this church of Henham to the same appropriation: this gift was called a manor, and named Plechedon Canons: afterwards the rectorial, or great tithes, being retained by the priory, a vicarage was instituted and endowed in the reign of King Henry the third, which continued in the patronage of the convent till ist dissolution; and in 1536, the rectory and advowson of the vicarage were granted to Robert Radcliffe, Earl of Sussex, from whom they passed to the successive owners of Henham Hall. Anne, daughter of John, Lord Crew, married to Sir Henry Wright, Bart, gave a farm at Little Henham, of about £40 a year, for the augmentation of this vicarage. A tenement, called Sammons, was given for a yearly obit ****. 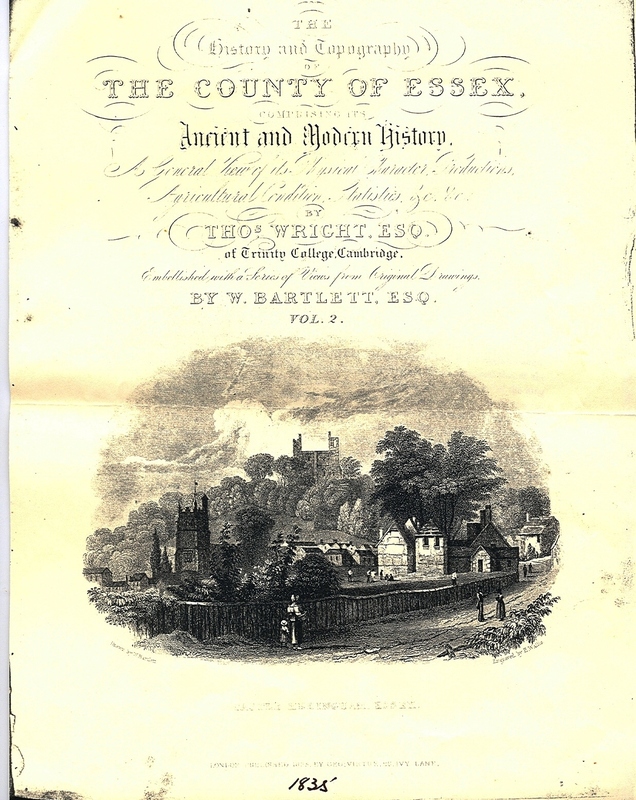 In 1821 this parish, with the Hamlet of Paxton, contained 804, and in 1831, 863 inhabitants. * this noble family resided a considerable time at Henham Hall. Robert FitzWalter was born there in 1249: as was also Walter, his son, in 1275; Walter, the son of Walter, in 1370, and Elizabeth, eldest daughter of Walter, Lord FitzWalter, in 1430, — Monastic. Anglic. vol.ii.p.76. * * in doomsday, it is placed under the hundred of clavering; and is stated to be a Hamlet in Henham parish, belonging to the late of clavering hundred. Many instances occur in other counties of land is exempt from the jurisdiction under which they are situated, and annexed to distant lordship scholar, swaying having been Lord of clavering, may have had extensive authority here, and the hundred may have had its dependence, as a castle Stortford head, from whence the country had its protection from inroads, in return for which, some estate had to pay towards their support.